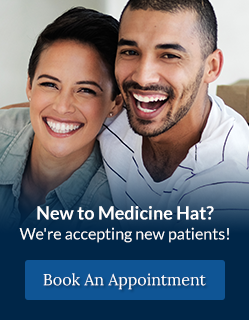 Medicine Hat Dentist, Dr. Eryn Comeau, was born and raised in Medicine Hat. She attended the Medicine Hat College and completed her Biological Sciences (BSc) degree at the University of Alberta. She then moved to Los Angeles with her husband Dr. Ryan Comeau to obtain her Doctor of Dental Surgery degree (DDS) from the University of Southern California (USC). Dr. Comeau’s dream of becoming a dentist began when she was very young. She feels very pleased to be the newest member of the River Dental team where she will be working alongside her father, Dr. Lydell Wenzel. Eryn is married to Dr. Ryan Comeau who is a chiropractor at The Ridge Spine and Sport.